Recent television credits include ‘The Comedy Store’ and ‘The World Stands Up’, (both Paramount), ‘My God I’m My Dad’ (Bravo) and ‘Street Cred Sudoku’ (UKG2). He is one of the regular writers on Channel 4’s hugely popular comedy panel show ‘8 Out of 10 Cats’ – responsible for scripting up-to-theminute topical gags every week for the show which features Jimmy Carr alongside team captains Dave Spikey and Sean Lock. On the airwaves, he was recently a guest panellist on comedy panel show ‘Jest A Minute’ (BBC Radio Wales) as well as contributing to review show ‘Serious About Comedy’ (BBC7). A fine topical writer and performer, and master of sharp observational comedy, Roger is a regular member of the prestigious and critically acclaimed ‘Cutting Edge’ team at the London Comedy Store. 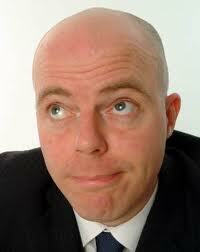 He also performed with the Manchester based topical and satirical team ‘MEN at Work’ at the Manchester Comedy Store. His forte is delivering intelligent, thought provoking material that pulls no punches and is always incisive, relevant and up to date. Articulate, quick witted and spontaneous, if something’s in the news, Roger has a routine about it. Roger’s distinctive voice and sharp enunciation make him particularly suited to voice over work. Raised in Kingston upon Thames, he retains his Estuary drawl and remains untainted by a South Yorkshire accent despite a decade of living in Sheffield.